SEATTLE--(BUSINESS WIRE)--Adaptive Biotechnologies, a leader in next-generation sequencing (NGS) of T- and B-cell receptors of the adaptive immune system, announced today their partnership with Microsoft to map the genetics of the human immune system, or immunome, in order to detect cancers and other diseases in their earliest stage, when they can be more effectively treated. 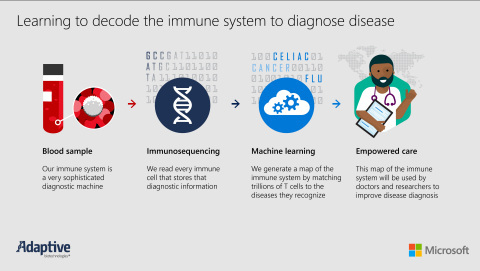 By combining Adaptive’s powerful immune sequencing technologies with Microsoft’s research and large-scale machine learning and cloud computing capabilities, the partners aim to create individual disease diagnostics and ultimately a universal diagnostic – all from a simple blood test. Under terms of the partnership, Microsoft has made a financial investment into Adaptive, in addition to bringing research and large-scale machine learning and cloud computing capabilities to the endeavor. The immune system is nature’s most finely-tuned diagnostic as it routinely scans and reads any signal of disease – such as a cancer cell or an infectious agent – in the body, and holds the genetic code that can give insights into detecting these diseases. Adaptive and Microsoft are partnering to translate this genetic code into simple blood-based diagnostics that are broadly accessible to people around the world. This collaboration is a cornerstone of Microsoft’s Healthcare NExT initiative, and a first partnership between a leading genomics and technology company to map the genetics of the immune system. The Microsoft Healthcare NExT initiative was launched last year to maximize the ability of artificial intelligence and cloud computing to accelerate innovation in the healthcare industry, advance science through technology, and turn the lifesaving potential of next discoveries into reality. The partnership will be discussed in greater detail at the 36th Annual J.P. Morgan Healthcare Conference in San Francisco at a fireside chat with Chad Robins, Adaptive CEO, and Peter Lee, Corporate VP, Microsoft AI and Research, on Wednesday, January 10 at 5:00 pm PT. The TCR Antigen Map consists of proprietary computational models using immune sequencing and machine learning that will allow us to decode the genetics of the immune system to detect most diseases earlier and more accurately. The T-cell receptor (TCR) is a receptor expressed on the surface of a T cell, a type of white blood cell; it is genetically encoded to recognize signals of disease, called antigens. By mapping TCR sequences to the antigens they bind, we will endeavor to mirror the natural diagnostic capability of the immune system in the clinic with individual disease diagnostics – and ultimately, a universal diagnostic – all from a simple blood test. Adaptive Biotechnologies is a pioneer and leader in combining high-throughput sequencing and expert bioinformatics to profile T-cell and B-cell receptors. Adaptive is bringing the accuracy and sensitivity of its immunosequencing platform into laboratories around the world to drive groundbreaking research in cancer and other immune-mediated diseases. Adaptive’s mission is to translate immunosequencing discoveries into clinical diagnostics and therapeutics to improve patient care. For more information, please visit adaptivebiotech.com.